INTERNal Dialogue: Chris the Intern joins the Boot gang! Hey everybody, my name is Chris and I’ll be the voice of this blog for the next ten weeks or so. Just a brief intro about me, I’m currently in the middle of a two-year master’s program at the Tufts Friedman School of Nutrition Science and Policy. Strangely enough, I am not really studying nutrition in the traditional sense. I am actually in a program called the Agriculture, Food & Environment program or AFE for short. Within AFE, students learn about all facets of the food system, from farms, to markets, to government, as well as to consumers and beyond. At this point in the program I have become a pro at explaining my coursework to confused family members who assume I will become a nutritionist upon graduation. Not quite! My introduction to Bootstrap was very organic in nature. After hearing about it from a number of AFE’ers who utilize the service in Somerville and JP, I reached out to the crew about a potential facility tour for a course I was taking on soil health. A small group of my cohort, affectionately dubbed the Soil Squad, chose to create our own six-week soil health directed study. A major part of the coursework was to connect with experts, professors and entrepreneurs promoting different facets of soil health across the country. For me, Bootstrap was an obvious choice. 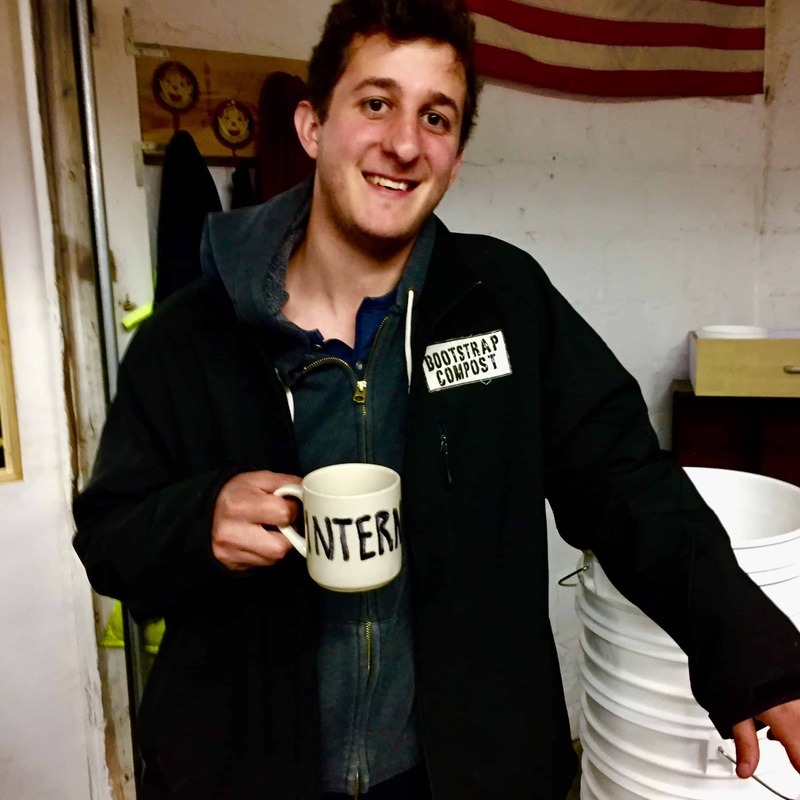 Although we never managed to tour the facility due to scheduling headaches, I seized the foot in the door opportunity to reach out about an internship and it turned out to be a perfect fit. 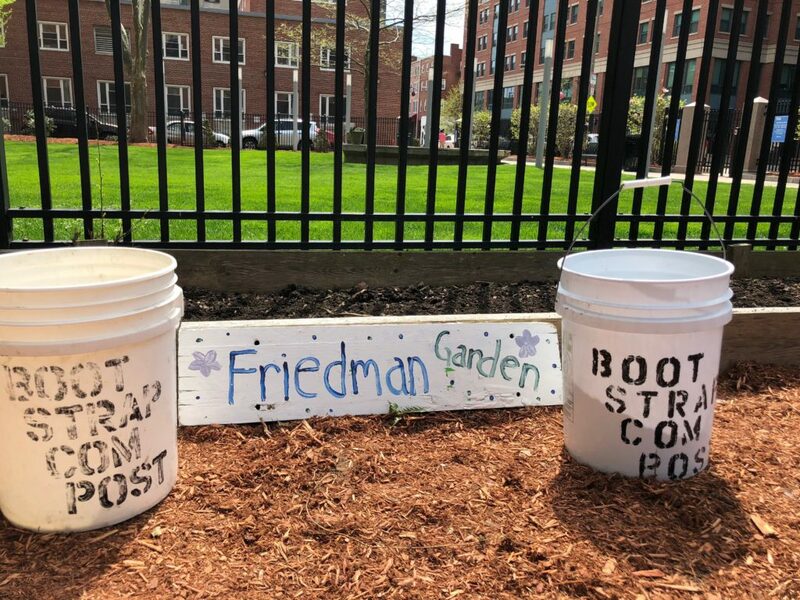 The real icing on the cake for me was that after being hired for the summer, I was able to take two 5-gallon buckets of fine compost to the Friedman Garden in downtown Boston. 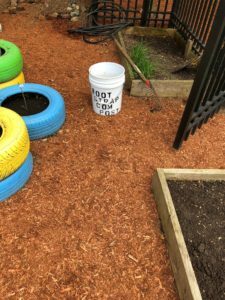 This material will go a long way toward revitalizing a garden that is relatively hidden among tall buildings in Chinatown. My connection to compost traces back to my youth in Reading, where I spent many a weekend with my dad dropping off lawn bags at the town compost pile. I always enjoyed climbing the massive steaming piles of leaves and other lawn debris and taking in the rich smell of decaying plant material. We always delighted in filling up buckets from the finished pile and adding it to the lawn and garden back at home. When I decided to dig up a large chunk of my lawn in high school to put in a pumpkin patch, I returned once again to the compost pile as a ready source of nutrients. I am still an avid gardener in my spare time, growing food in my backyard and down the street at my local community garden where I serve as the “Compost Guru.” My studies at Friedman have only helped to cement my interest in soil and the art and science of growing sustainable food. I am a passionate environmentalist and find conservation agriculture to be a subject worth pursuing in the future. My first day at Bootstrap was this Monday and I would categorize the vibe as go with the flow. After a brief meeting in the morning about nuts and bolts, I was invited to participate in a pickup in Cambridge and trip to the farm in Saugus. This was a great opportunity to learn about the day to day operations at BSC. In Cambridge, we picked up scraps from a restaurant with three very full 64-gallon bins, threw the bags in the truck and zipped over to Saugus. There we emptied out about 50 farm cans which totaled around 3500 pounds of food waste! I can’t say that smelled as good as the leaf piles from my youth, but it certainly made for an eventful morning. When we got back, I was able to sit in on a social media meeting, where I was tasked with coming up with ideas for tweets. Make sure to look for those in the coming weeks. I am planning on producing a recurring thread called the “Soil Health Minute” with info about this fascinating subject. That is all for now. I look forward to writing about my experience here and learning more as I go!